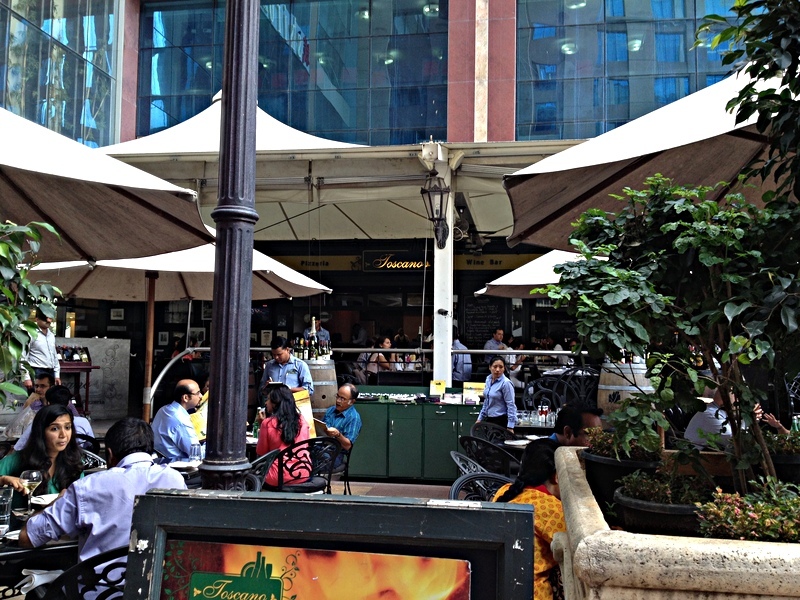 UPN visited Bangalore's popular trattoria-style Toscano and came away sighing - while the overall experience won't blow your borsalino hat off, the joint's front section has a pleasantly European al fresco space where you may justifiably sit with your bellisima, after warning her that you feel compelled to expose her to middle-weight "Bangalore-Italian" food. Cuisine - 6.5/10 overall. 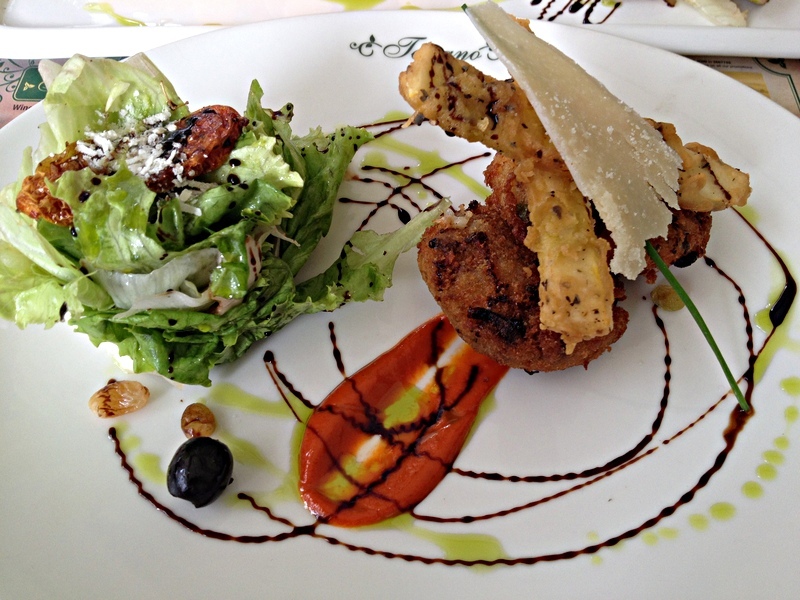 Though several Indian chefs in recent years have gained experience in Western cuisine, a winning sense of presentation in continental dishes, is often not their forte. For Toscano, chefs Jean Michel Jasserand and Goutham Balasubramanian have joined forces, and the most auspicious symbol of their collaboration lies in the sprawling elegance of their food design- a transition between ambitious canteen and expert haute cuisine. Fine slices of complimentary bread were first served with olive butter which you may slather on and much away contentedly. 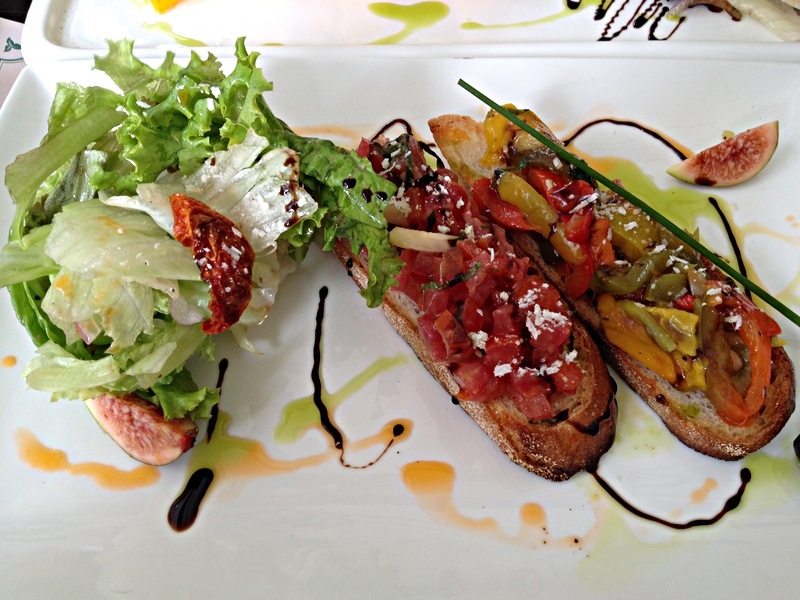 Bruschetta was comprised by two crisp discs of bread - one topped with brunoised tomato, and another with multi-colour bell peppers. I tasted the latter and while its freshness and zing were indisputable, I'd have liked the bread to have more involving body. Chicken ,spinach and cheese poplettini again had high ingredient quality and efficiency in execution, topped off again with compositional finesse by way of a mini-skewer, a plate-bisecting line of balsamic adjacent to eye-catching geometric circles of an orange piquant sauce - all this pretty circus still couldn't detract from the fact that the poplettini lacked nice taste. Parma Ham on Melon was also a finely presented dish, featuring a multitude of associate players - pickled squash, fresh figs, ricotta ,olives, default foliage and whatnot. But the 24-month aged "crudo" ham was too briny for me to appreciate its silken meaty notes - it has put me off tastings of aged-ham, unless of course some nice soul is prepared to finance this renewed exploration. The best snacks of that afternoon were Fried mozarella and Arrancini - the batter was an excellent crisp coating and we had a cross-cultural revelation after noting that the Arancini - crumb-fried balls of arborio rice fortified with cheese - were the Italian "bichda hua bhai" (Hindi for "long lost brother") of India's Sabudana Vada! 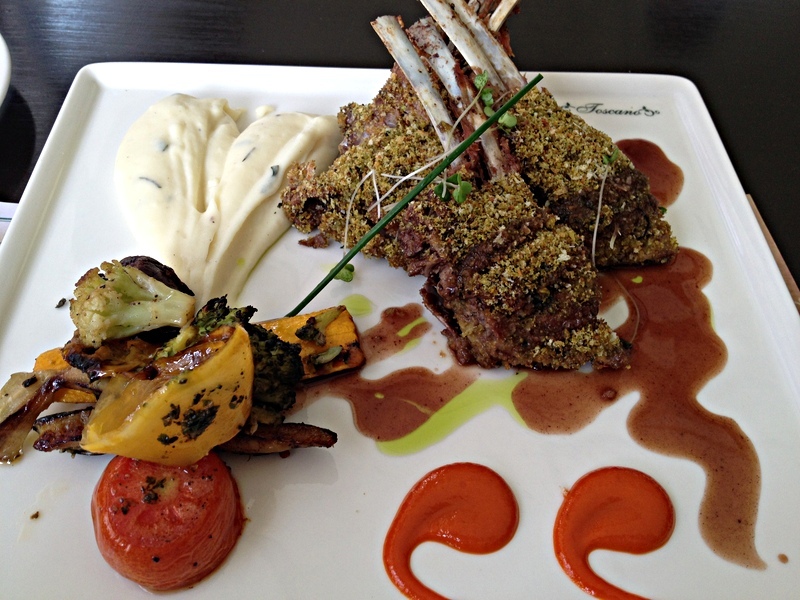 Heavenly lamb distinguishes itself with a moist velvety mouthfeel - connoisseurs happily know this. Pistachio crusted rack of said meat which occupies pride of place on Toscano's main course list, lacked this rarefied quality. The meat was so difficult to cut off the jagged edges and crevices of the rack that though I was given a neatly utilitarian serrated knife, an automatic-search-dissect-and-isolate device would have been more appropriate to tackle this sequestered lamb that racked my cutlery skills. My companion made bold by wine, was so frustrated by this dish that he grabbed the piece of meat by its generously boned handle and transferred it to my plate while I let out a bleat of martyrdom. 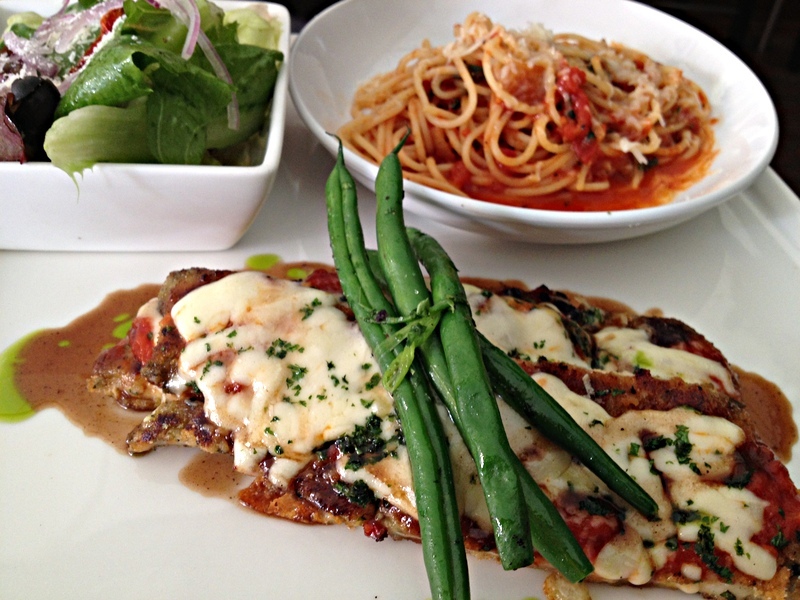 Since this was Italian and not French cuisine, the lack of sauce was not bemoaned. Mashed potato, however, needed to be twice or thrice as creamy - you could bet your bottom rupee that I wouldn't hazard a guess, in a blind tasting, about these being the fabled Joel Robuchon potatoes. 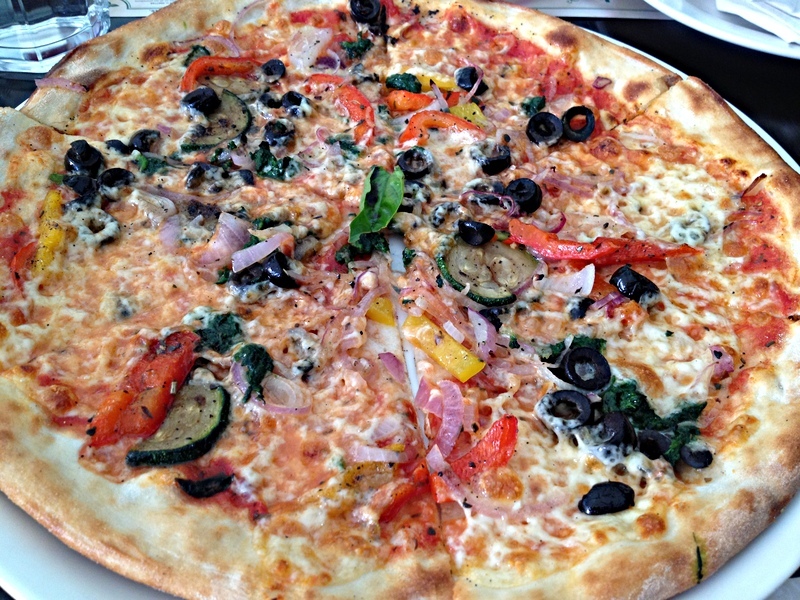 Toscano is reputed for its thin-crust pizzas - so I ordered a Pizza Verdure on the waiter's recommendation, moreover I had to consider a vegetarian at our table. 6 decently sized slices of gentle taste and pleasant texture were presented - but this is not the product to fall back on if you're looking to convert a pizza-indifferent patron. 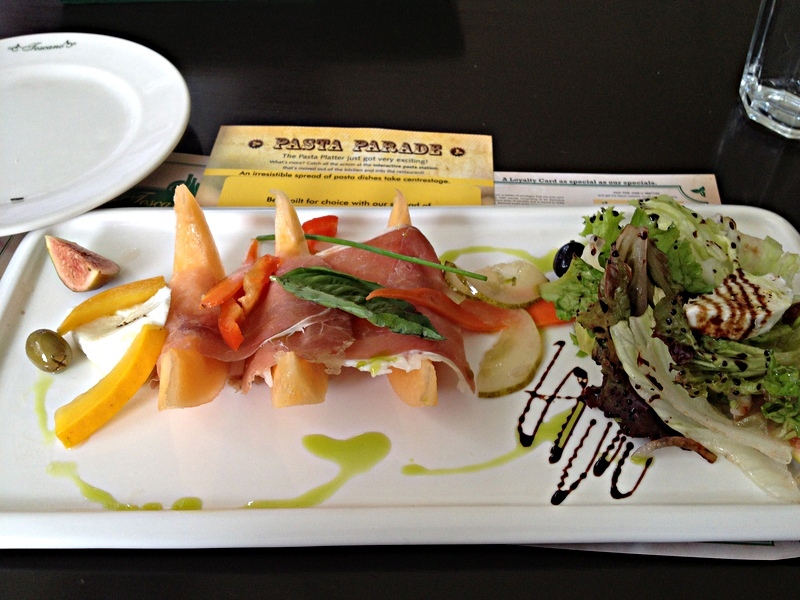 Service 5.5/10 Servers showed adequate concern and politeness in attending to us in the first visit. But don't expect world-class vigilance here - more staff and better training will be needed for that. Our waiter on the first visit, though courteous and good overall, had the rather odd habit of widening and rolling his eyes when certain dishes were ordered - as if I was requesting an order of Monica Bellucci served without the dressing -but I suspect this sporadic behaviour was attributable to a circum-ocular tic rather than his personal disapproval. On the second visit on a Sunday, the service was strictly mediocre, with inattentive spells and zero charm. 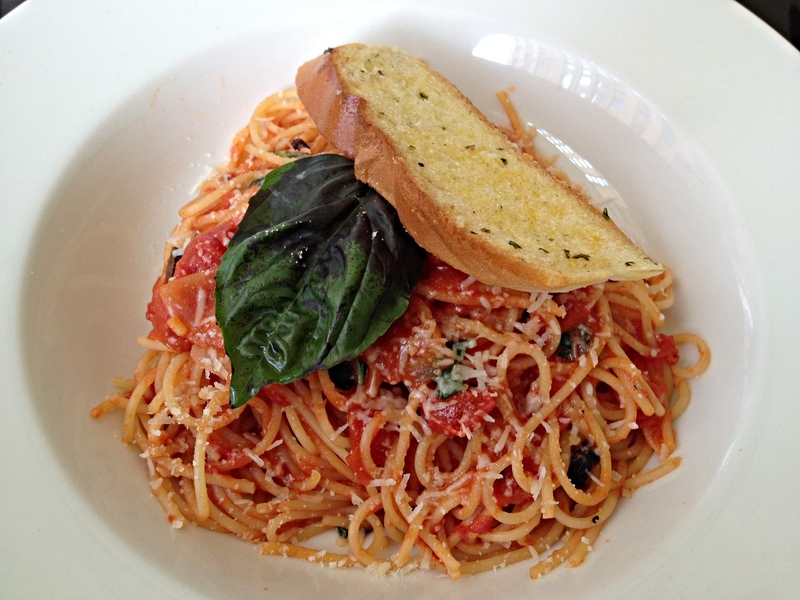 I had, with specific purpose, ordered Spaghetti Pomodoro to see how the kitchen would elevate these elemental flavours - tomato,basil, olive oil - to empyrean heights. It only ended up passing muster- I'll have to taste the same dish in Scott Conant's Scarpetta, rapturously described by Frank Bruni, to check what has been described as an elite version of this dish. 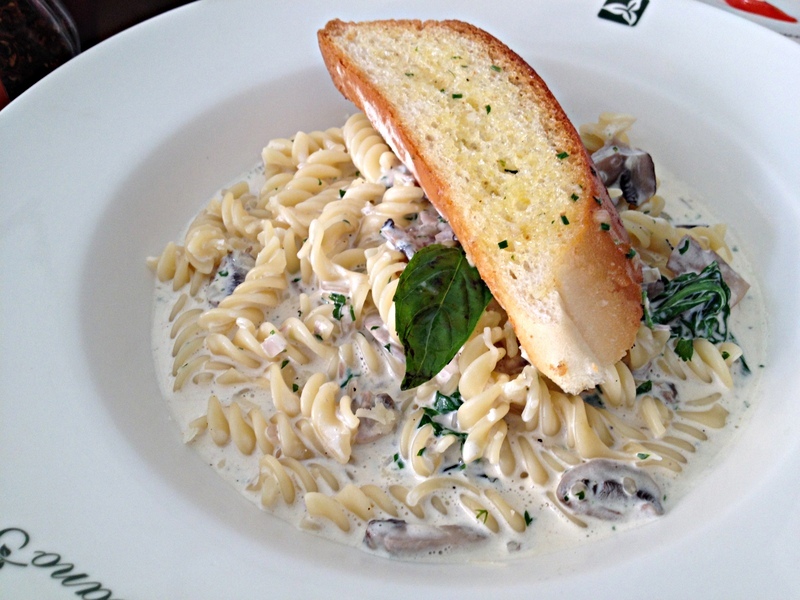 The second pasta -Fusilli funghi spinach - rode on the crowd-pleasing appeal of its white cheese sauce, but the dish had no special complexity or delicate nuance. 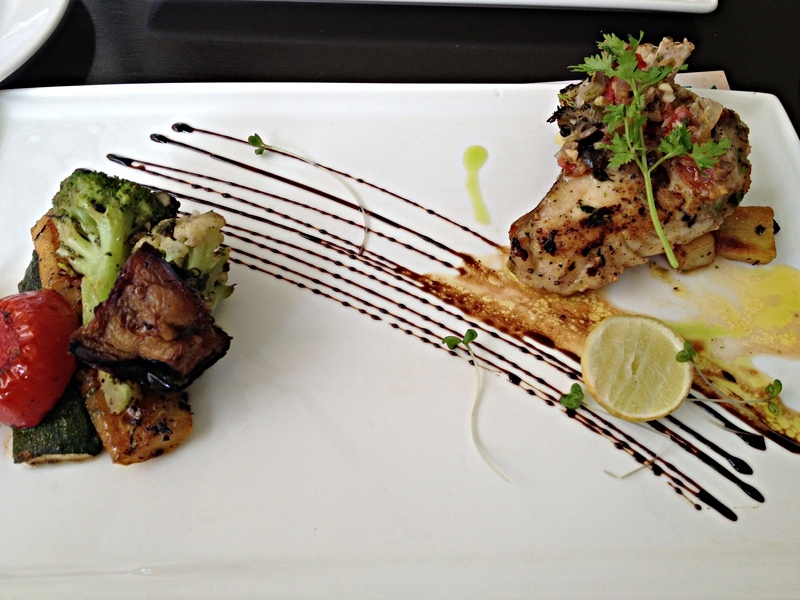 Style again manifested itself with offerings from the sea - serial swipes of balsamic occupied center-stage, prettily garnished cuts of sea bass were beached at one end, while a collage of grilled vegetables nestled on the other side. While the fish easily attained pass marks by taste and texture, fish connoisseurs are better off not ordering this with expectations of finding stunning marine depth. Chicken Parmeggiana was the last main we tasted - even from a visual point of view, the lack of focus was evident - a tied stack of green beans were placed atop the chicken, and a bowl of salad was placed on the same plate.These wouldn't have incited my disapproval were it not for the fact that the main player per se had middling flavour and passable meat - it was no match for the luscious blend of tomato,cheese and succulent breast of chicken I ate for lunch in a psychiatry clinic in Roanoke,Va. in 2009. Ambience -7/10 A modernized Trattoria - the front section through which you enter is a nicely Euro-flavoured al fresco cafe with black chairs and tables under large white-cloth patio umbrellas. Stacks of wine bottles perch atop sporadic barrels along the border of the raised interior deck - this space is not as charming as the one out front, and though it's not a completely indoor section ,it's a better place to repair to when it's raining. Wooden slats form the floor there while tables and chairs are heavy affairs of dark brown wood, the latter inset with dark green leather cushions. A large high white synthetic ceiling overhead stretches out like a tent. At the back ,the restaurant's name is discreetly inscribed in a flowing glow of yellow set against dark green –this wall sports sepia portraits on the left, a bar on the right while the middle leads to the kitchen. 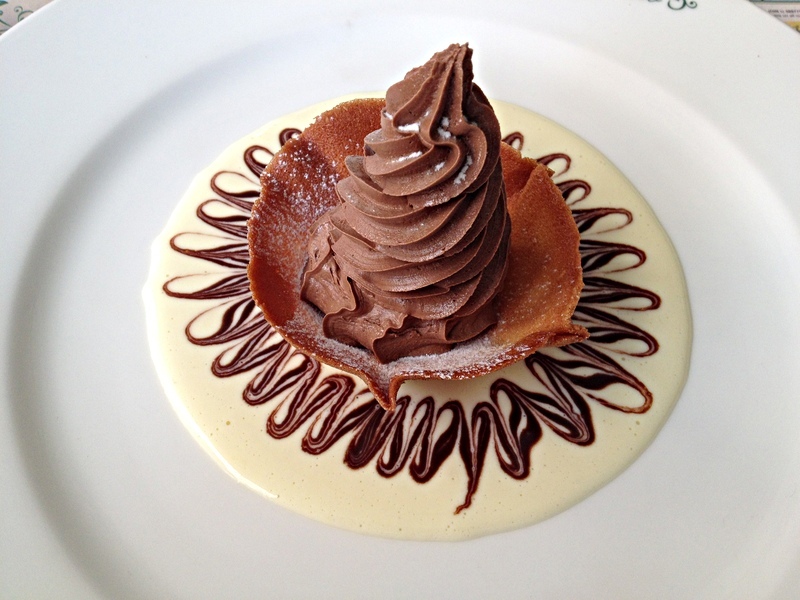 The first of the 5 desserts was a superbly presented Kahlua Mouse - a perfect blend of chocolate and liquor -the mousse's richness cut by a leaner sophistication. Nonetheless, it needed a more nuanced accompaniment than the intricately patterned caramel sauce. Next up was a dessert of fine balance and myriad gestalts - a pave of white chocolate and mellow mango around which a wheel and stick of chocolate were artfully parked. 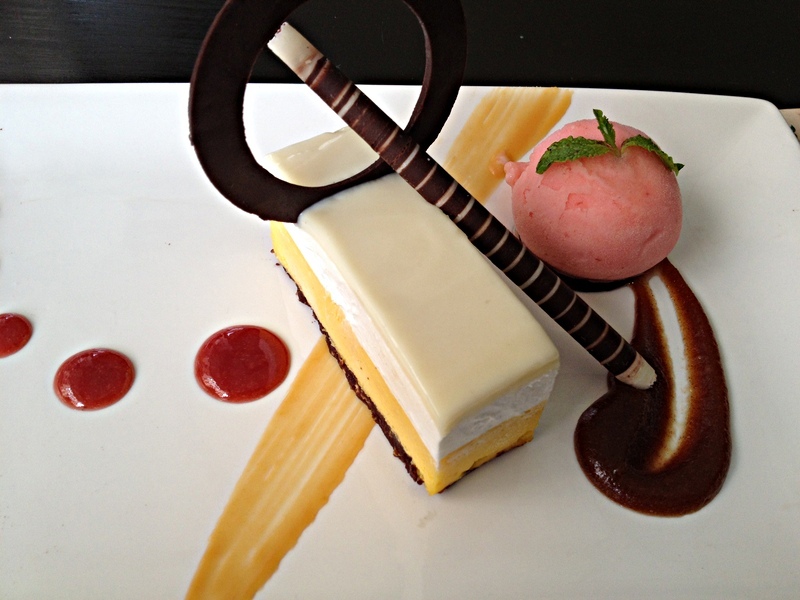 This slice of white-yellow cake acquired much better zip when paired with acidic flicks of a cinnamon-date blend, as well as a raspberry coulis.Satisfaction was complete with refreshingly icy whispers of a strawberry quenelle. 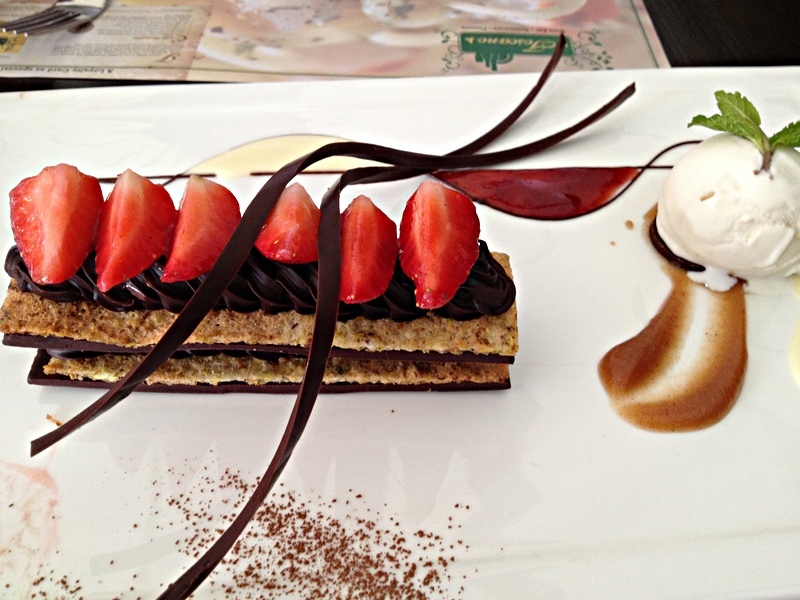 The fact that looks can be deceiving applies to people as well as desserts - Toscano's weekend special of Mille Feuille of Amarula dark chocolate ganache, crowned with strawberries, was a visual hoot but we struggled to cut the Mille Feuille which had mediocre taste to boot. 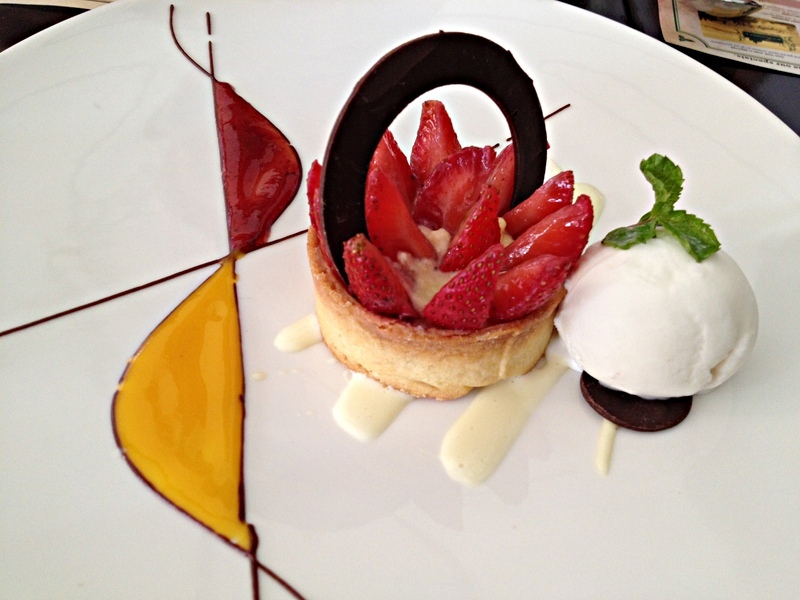 The only good thing about the Strawberry Tart was a sculpted pool of mango sauce which too little to fully enjoy. None of us had tasted a crepe suzette before - we also missed being accorded the bonus of the table-side theatre of blue flames leaping out of the flambeed pan, whilst the server expertly layers the crepe batter, turns and eases it all around to gift us a perfect crepe. 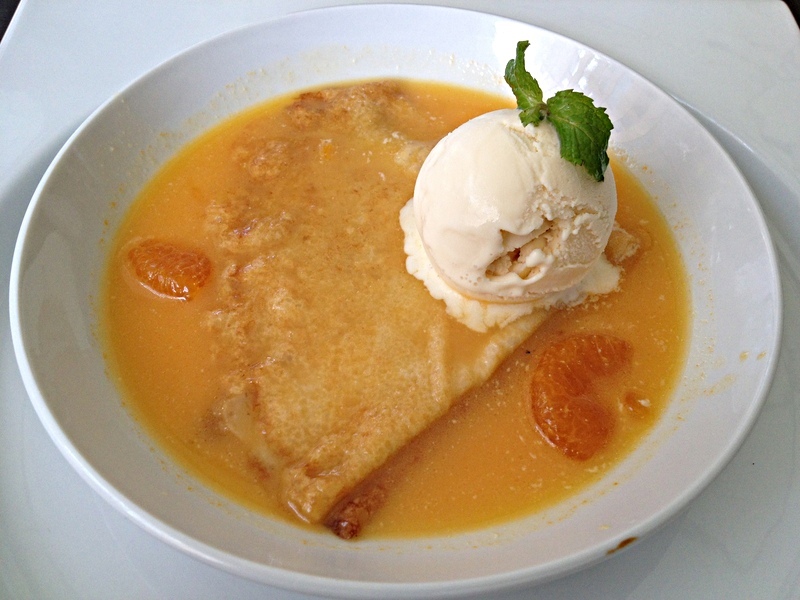 Our crepe suzette, disappointingly, was made and plated in the kitchen. Anyway the Orange brandy sauce was a bracing blend perked up by citrus-intensifying orange rinds, but the crepe, alas, was almost submerged in it - upkeep of a crisp caramelized exterior would surely have enriched the crepe's overall appeal. Mollifyingly, a dollop of lovely French Vanilla added a riveting balance to the sauce. Tariffs - There's a Rs.565 plus tax (VAT+ service tax + service charge) 3 course lunch menu on weekdays which is value for money, but on our second visit 1 pizza, 2 mains and 2 desserts were billed to a final sum of Rs.2346 which was not good value for our overall experience. 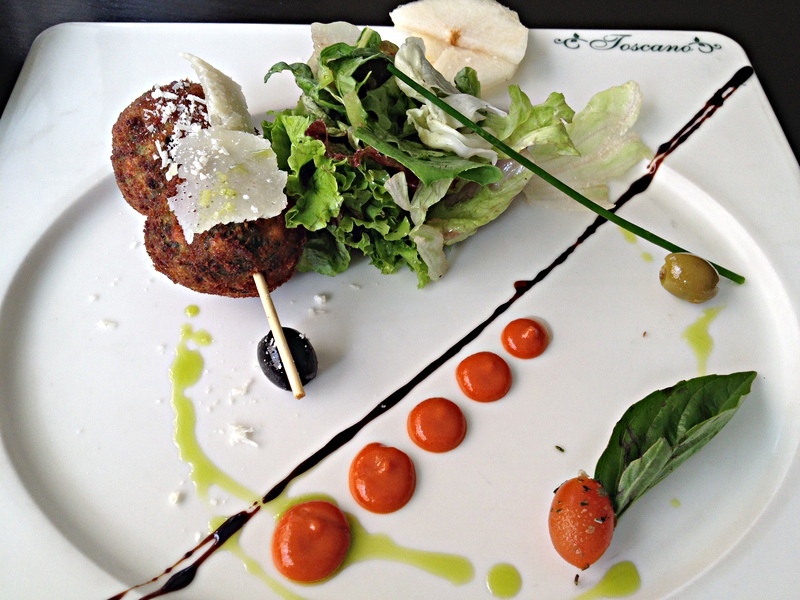 So Toscano eventually comes across as casual-chic joint offering stylishly plated above-average food served by mediocre staff. Chef Bruno Ferrari of the nearby Alba at the JW Marriott (where the food is more authentic and marginally better, but also, of course, costlier) scoffs at it, many patrons like it a lot, and I feel no compelling reason to come back here.